The investment treaty regime is mostly bilateral, but with creeping multilateralist tendencies. What I mean by that, as I explained in this WaPo piece, is that investors (and ultimately arbitrators) can pull from a wide range of different obligations between Country A and Country B, even if they are from neither. This is due to most-favored nation rules (or MFN, which require a host state to accord an investor of a given country the BEST treatment they accord investors of any country) and lax definitions of “investor” (which can extend to entities from any country, so long as they incorporate in a country with ISDS treaty protections). Creeping multilateralism is different than real multilateralism. Unlike true multilateral pacts like the WTO, the 3,200 investment treaties are not a single undertaking that (at least in theory) constitutes a thought-through tapestry that balances between members, sectors and obligations. Instead, it is an ad hoc multilateralism, where the protections an investor can claim for themselves vary in proportion to their wiliness and legal ingenuity. The final TPP text closes some options for creeping multilateralism, and opens others. Warning: this is pretty wonky, even by this blog’s standards. There are two ways that the TPP closes some off some creeping multilateralism. First, Article 9.5.3 spells out that “the treatment referred to in this Article [MFN rules] does not encompass international dispute resolution procedures or mechanisms, such as those included in Section B”. 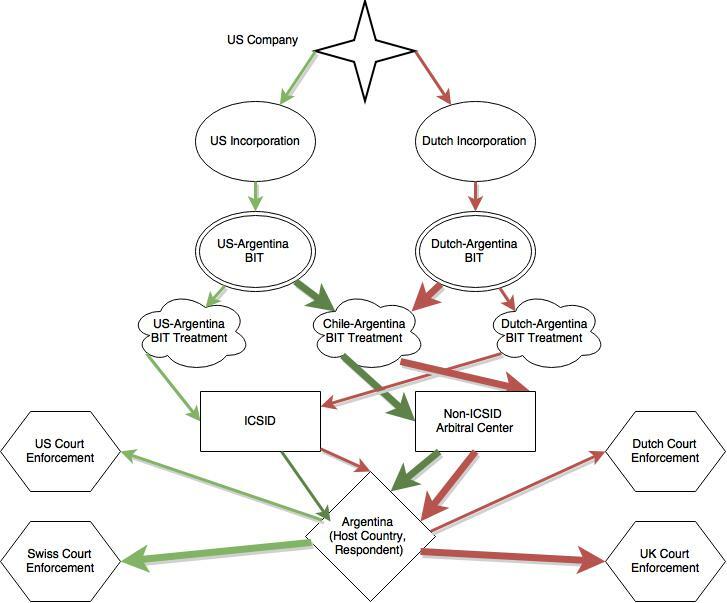 To decode, Section B of most US investment chapters are the procedural aspects of dispute settlement, while Section A involves the substantive standards of treatment (like fair and equitable treatment). So this cuts off any attempts for an investor to import more investor-friendly procedural rules from other BITs into their TPP claim. This may not really matter that much, since most of the procedural rules are spelled out in truly multilateral pacts like the Washington and New York Conventions. This is a reservation from the MFN obligations of the investment and services chapters, and it applies to all sectors of the economy. My read of it is that a substantive or procedural standard of treatment from some other BIT/FTA that is better (or worse) can’t be imported into the TPP. If the TPP standard of treatment is better than NAFTA, a Canadian investor suing the US could use the TPP. They could also use MFN rules in NAFTA to get the TPP treatment (since the similar Annex reservation in NAFTA only applies to pre-NAFTA agreements) . If the NAFTA standard is better than the TPP, then that same investor could use NAFTA. What would not be allowed (due to the TPP Annex II and Article 9.5.3) is using the TPP to get better treatment from NAFTA. I’ll call this backward-MFN. However, forward-MFN (using NAFTA to get TPP, or using TPP to get some post-TPP agreement) is allowed. Finally, non-TPP country investors with pre-TPP BITs/FTAs can access any better treatment in the TPP. They can do this either through structuring the investments they want protected through an ownership structure in a TPP country, or by using their own country’s BIT/FTA MFN provisions to import the TPP treatment. Finally, it’s worth remembering that the policy justification for MFN is efficiency-based. In other words, static economic theory would suggest that it is sub-optimal to structure policy so that it to discriminates against investors depending on their country of incorporation. The extension of MFN to substantive and procedural legal protections under international treaties is a legalistic sideshow from this main justification. Bizarrely, this raison d’etre of MFN is scaled back in the TPP by the restriction of MFN to only those investors that find themselves in “like circumstances”. This comparator “depends on the totality of the circumstances, including whether the relevant treatment distinguishes between investors or investments on the basis of legitimate public welfare objectives”. So, if a government can come up with a reason to discriminate, it may be able to get off the hook! Could arbitrators simply ignore the Annex II reservations? Preambles of BITs/FTAs/TPP make pretty clear that the goal is deeper integration. Arbitrators would look skeptically at a respondent country argument that there is a compelling policy reason to favor some investors over others based on national origin. A CAFTA case against the US has urged exactly such an interpretation when so-called “minimum standards of treatment are at issue: (fn3), while Peru has argued the opposite in a recent ISDS filing (para 294). How will arbitrators interpret the repetition of the Annex II language? The “reserves the right” language repeats twice – the first time applying to all sectors, and the second time only to a few sectors. Treaty interpreters frown on finding that language is redundant. How will they ensure that each repetition is given a separate meaning, especially since latter repetition is not cordoned off by a “for greater certainty…” type language? The Annex II language refers to “differential treatment to countries”, not “to investors”. Might a tribunal read something mischievous into that? Say there is a more investor-friendly expropriation standard in one of the treaties relative to another. Say that treaty also had strong state defense provisions for the environment. Would an arbitral tribunal allow use of MFN to import the expropriation standard alone, or would they read that standard in light of the treaty (and its defense standards) from whence it came? Investors could still use clever incorporation schemes to claim to be from a country with an advantageous treaty. * Only Malaysia’s formulation varies: “Most-Favoured-Nation treatment may not be accorded to foreign investors and their investments with respect to preferential treatment granted under any existing free Trade area agreements” (ii-mys-6). Unsure what this means. ** A TPP formatting notes that precedes the Annex II schedules reads: “With respect to Annex II NCMs on Most-Favoured-Nation Treatment relating to bilateral or multilateral international agreements, the absence of language regarding the scope of the reservation for differential treatment resulting from an amendment of those bilateral or multilateral international agreements in force or signed prior to the date of entry into force of this Agreement is without prejudice to each Party’s respective interpretation of the scope of that reservation”. Previous Post What is “Arbitration”?